On the anniversary of this tragic fire, we are reminded that many of our code changes come out of the ashes and serve as a guardian to protect future lives. The our lady of angles fire, an extreme tragedy, where the City of Chicago Mourns and hearts are broken all across the world. 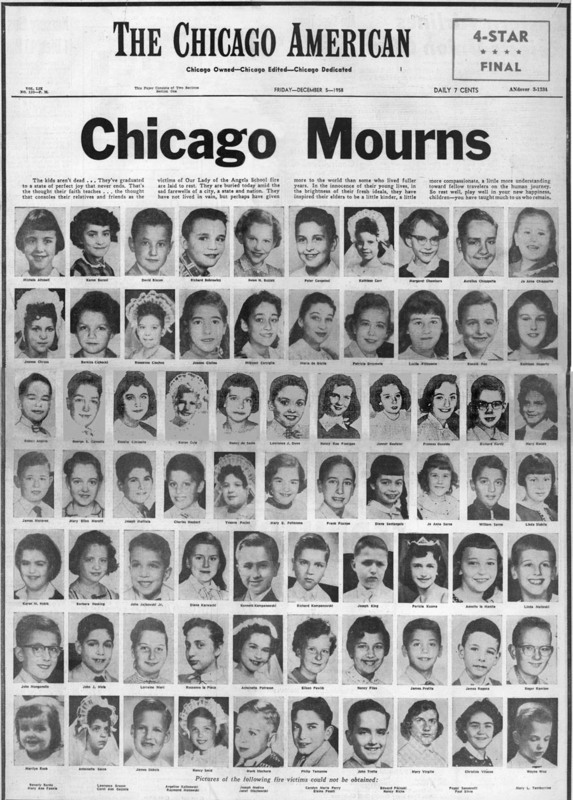 On December 1, 1958, a tragic fire broke out in a catholic school in Chicago which claimed the lives of 92 school children and three nuns. At the anniversary of this tragic event, it is important that we look at how this fire claimed so many lives and what can be done to ensure it doesn’t happen again. The original building, a two story school house, was built around 1910 with several additions. The building could house up to 1600 students in K-8th grade and the building lacked many of today’s fire safety features such as enclosed stairways, multiple egress points, automatic sprinkler systems, automatic fire alarm systems, and good fire protection practices. The fire started in the basement approximately 20-30 minutes before it was detected in the cardboard waste basket. This fire sent smoke and heat up the stairwell and unprotected openings up to the attic. It cut off the only way for students and nuns on the second floor to get out. The first arriving fire department unit arrived in under four minutes and began rescuing children from the second floor, but the unbearable conditions had mad many children jump or were overcame by the smoke and heat. The school had passed its inspection nearly 4 weeks prior to the incident, in part, due to the “grandfathering”clause to the 1948 safety standards. At that time, the NFPA Exits Code was available which included many of the lessons learned from the Lake View School Fire in Collinwood Ohio, March of 1908. The building was one fire area and lacked separation in the building as well as between floors. The stairs were of combustible construction with tar and asphalt surfaces. The construction of the stairs and the interior finish are not allowed in the exit code at that time. Training of staff to evacuate students early is a necessity. When smoke is detected all students must be evacuated immediately. Mounting of fire extinguishers must be within the standard as outlined by NFPA 10. Combustible waste material should be orderly, of limited amount, and removed from the building on a frequent basis. Combustible materials should not be stored in exit stairs or mechanical rooms. Fire Alarm pull box or automatic alarm which summons the fire department immediately. NFPA gave strong words in the Quartley report on this fire. We must continue to remember the past and look toward always protecting our children in Schools. Are there lessons learned from this fire that could still be found in your schools today? Every fire service and safety professional should know about and review the lessons of this tragic event. History can be a great teacher, if we listen….. In the first two days of this month (December 08) 32 civilians have lost their lives to fire in America. In modern times this is unbelievable and inexcusable. We must all work harder and increase our vigilence to assure that codes are enforced, smoke detectors are installed and operational and the public is properly educated as to the daily tradegies that are occuring in America.